Going camping is always a fun and exciting experience for me. This past weekend I gathered with my cousins on my father’s side and we all went up to Wolf Creek Pass (9,500 feet above sea level) and camped out where my grandfather herded sheep a century ago in Utah. The highlight of the trip was to get in our cars and drive out to where his sheep wagon would have been parked and then think of what it was like for him when he was herding sheep here for so many years. Friday night as we all gathered around the campfire, my cousin Ernie played a tape that was created 25 years ago, when the family gathered at Liberty Park in Salt Lake City, and our father and his brothers and sisters told their stories about what early life of being raised by a strong mother (Lizzie) and a hard-working sheepherder (Ern) was like in the early 1900’s. Grandma Lizzie and Grandpa Ern on their wedding day. I never met my grandfather, who passed away about eight years before I was born, but I have always heard about his challenging life. Grandpa John Earnest Thomas was born in Center Creek (near Heber, Utah) on November 5, 1783. He was the eighth child of Joseph and Margaret Thomas. Great Grandpa Joseph was born in Council Bluff, Iowa, and came to Utah with the Bryant Jolley Company, arriving on September 9, 1852. 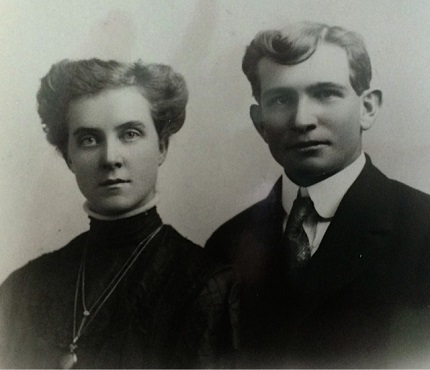 After he married Margaret Watson they homesteaded a farm in Center Creek and built a two-room house to live in. My grandpa Ern was the eighth child. Uncle Hal, as I always heard him referred to, was born about 18 months later. In the winter of 1886, when my grandfather Ern was two years old, his father Joseph became ill with pneumonia and died after a short illness, leaving Margaret to raise the small family that ranged from 6 months to the oldest being 18 years old. Two weeks later Margaret became ill with pneumonia and died, leaving the nine children to raise themselves. Saida, the oldest one, married John Austin and took my grandfather Ern to live with them. The rest of the kids got farmed out to relatives, and as the older children got married, they took a younger child in with them to raise. School was a challenge because they had to walk to school, which was two miles away and the winters were cold. 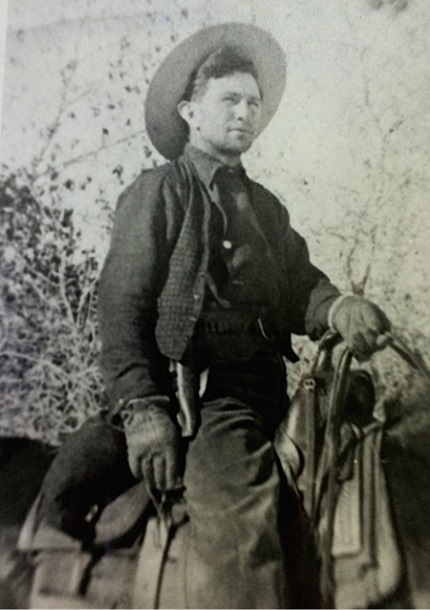 When he was nine years old, Ern went to work at the sheep camp for his brother-in-law. His duties were to cook the meals, care for the camp, bring the water, then to pack up the horses and move the camp to another location when the herd moved. He used to say he had to put the packs on the packhorses when he was so small that he had to stand on the water bags to reach the saddle bags. With years of practice and experience he graduated to a sheepherder. He married Grandma Lizzie and they together raised six children. My father Julian was the second-oldest. Here I was at the top of the world to learn about Grandpa Ern. I could see that he took what was given to him and made the best out of each situation. 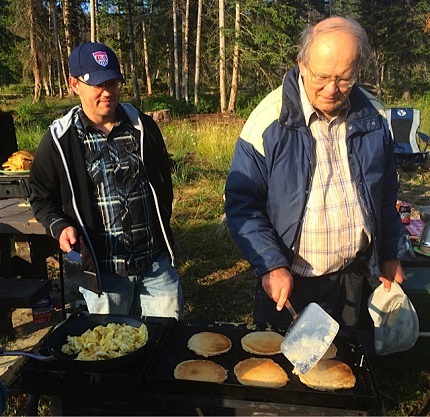 When we got up Saturday morning, my brother Jared cooked Grandpa Ern’s famous sheepherder pancakes. I could see that my love for the outdoors was well nurtured right here by my grandfather for years. My brother Jared presided over the pancake station at last week’s camping trip. The love and appreciation for nature was the magic that was passed down to my father Julian, who was a Forest Ranger for his career. It was then passed to me on all the outdoor trips and adventures I went on with my family as I grew up. My entire career has been dedicated to teach others to love the outdoors and to go and enjoy them as my grandfather Ern did. This short camping trip gave us all time to reflect on this simple but humble man who gave his entire life so that his family could be blessed in so many ways. Sheep still graze where my Grandpa Ern was a sheepherder more than a century ago. Dian Thomas has spent her life writing books and being in the media demonstrating her creative ideas. Now she is a tour leader, leading adventure trips to such fun places as South Africa, Peru, China, and Europe. To learn more about her trips, go to www.dickjensentours.com or call the office at (801) 917-1131. Tell them that Dian sent you and they will give you a discount on your next trip. She will be leading a trip to Peru that leaves in September. For special sales on her books, go to www.dianthomas.com.